This is so easy, it hardly qualifies as a recipe. It is so tasty, however, that I thought I should mention it! These tomatoes are a novel twist on the traditional tomato, mozzarella, and basil salad and are another wonderful use for Asiago Pesto Spread. You may certainly substitute your favorite pesto, purchased or homemade. These tomatoes are a perfect, speedy side to fish, chicken, or steak. They also pair nicely with corn on the cob and most any green vegetable or potato. Cut tomatoes into thick slices and place on a lightly greased baking sheet. 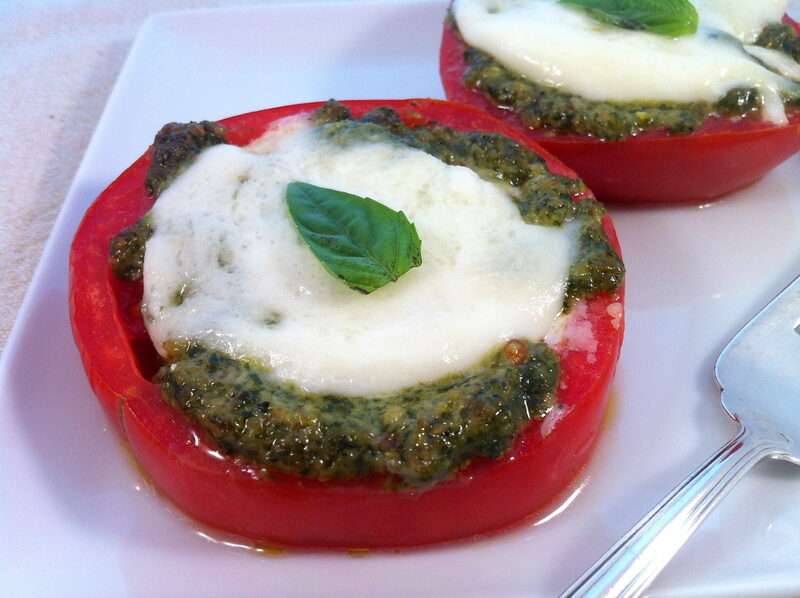 Top with a teaspoon or two of the pesto, followed by a thin slice of fresh mozzarella. Broil for 1-2 minutes, watching closely, or until the cheese is melted and bubbly. So simple and delicious (not to mention gorgeous)! I love it!